A Perseid meteor crosses along the Milky Way in August 2017, illuminating the dark sky near Comillas, in northern Spain. Darker locations are better — away from city lights if possible — but otherwise, any location will do. You can look anywhere in the sky; there's no need to focus on a particular location. Let your eyes adjust, and wait. You can also watch the Perseids online, but barring bad weather, we hesitate to recommend that route. C'mon. Life is short. Grab a picnic blanket. 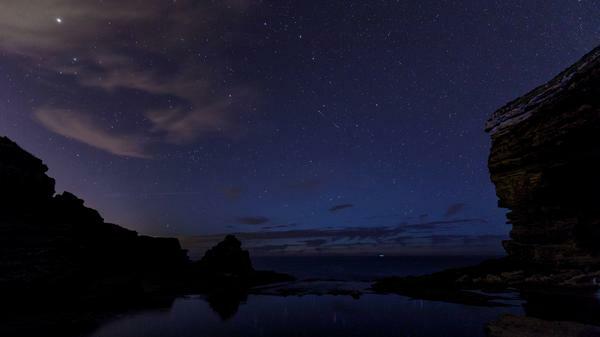 The Perseid shower is famous for bright, fast meteors that leave a long wake behind them, NASA says. You can spot 50 to 100 of them each hour. "Perseids are also known for their fireballs," NASA writes. "Fireballs are larger explosions of light and color that can persist longer than an average meteor streak. This is due to the fact that fireballs originate from larger particles of cometary material. Fireballs are also brighter." If you pay attention to the trajectories of the shooting stars in the sky, they look like they're all coming from a point right by the constellation Perseus, NASA says — hence the name Perseids. "However, the constellation for which a meteor shower is named only serves to aid viewers in determining which shower they are viewing on a given night," NASA notes. "The constellation is not the source of the meteors." Instead, the meteors are remnants of the trail left by the less romantically named comet 109P/Swift-Tuttle. As Earth passes through that streak of space debris, the bits of rubble turn into flaming streaks across our sky.